In the applets below, Any polygon that is orange is a CONVEX POLYGON. Any polygon that is blue is a CONCAVE POLYGON. Interact with these applets for a few minutes. As you do, be sure to move the polygon's BIG WHITE VERTICES AROUND! Then, answer the questions that follow. 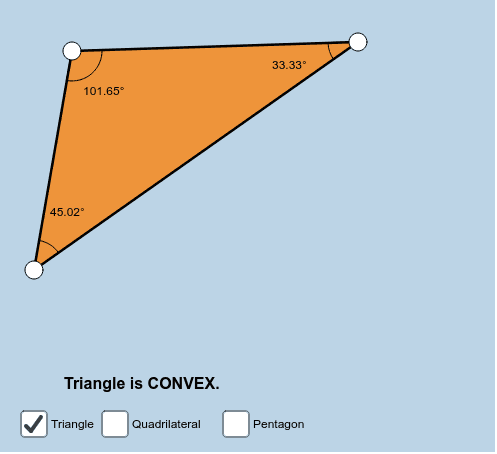 According to the 2nd applet, how would you describe what it means for a polygon to be convex? How would you describe what it means for a polygon to be concave? Take another look at the 1st applet. How could you define the terms convex and concave with respect to the segment "inside" the polygon? 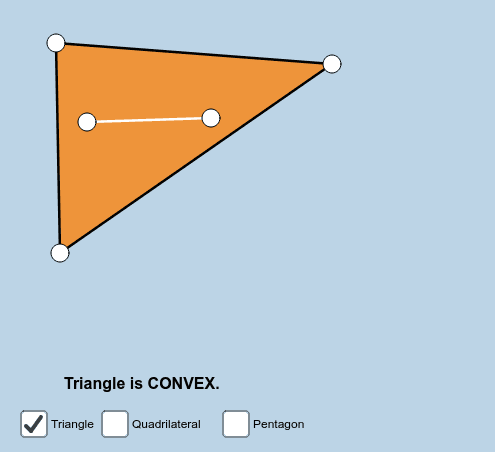 Is it ever possible for a triangle to be concave? Why or why not?